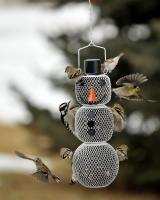 Offer a smorgasbord of different seeds to your backyard birds with the Triple Bin Party bird feeder from Homestead. 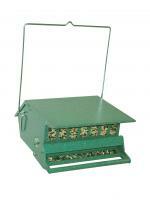 This large feeder holds up to 11.5 lbs of seed and the three compartments each hold a different kind of seed, allowing you to attract an array of species. With six long perches around the green bird feeder, the party never gets too crowded. When the seed is running low, the roof comes off for easy refilling. 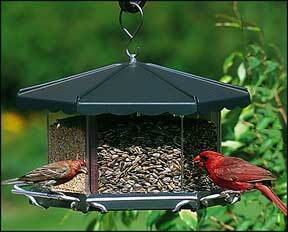 Built with heavy-duty rust-resistant steel, the feeder can withstand even the wildest of bird parties. Love the feeder. Clear acrylic piece was real cloudy and brittle. Just got new one from Apollo which is a division of Homestead. Most popular feeder in town - added a hoop so the BIRDS could have it instead of my 4 dogs - it's all great! The fourth one we've owned in a out 12 years. Easy to fill, and the birds always come to it and feed. After a while, the plastic breaks down, and being outside, and used year round in Ohio weather, it's in need of replacement. We still think it's a very good product. The one we just got is waiting for spring to return, and then we'll set it up. I love this feeder and have had one for many many years. Years ago, I used to be able to purchase just the acrylic triple bin hopper to replace a broken/cracked one. But I can't find the replacements anymore. Now, when the 3 compartment hopper breaks/cracks, I have to buy a whole new entire feeder. I find that so wasteful because the steel top and bottom will last forever. Still, it is a really good feeder. Product is just what I wanted. The birds love it. Not my first one and will not be the last. I love my feeder!! !I can feed several types of seed to attract other types of birds. It holds lots of seeds!! This is the best feeder I have ever used. I like the ease in refilling the container. I am very anxious to put this feeder up in my yard. I still have tons of snow in my front yard. Still waiting for spring. I love it! I didn't think I would like it at first because I wanted something more decorative, but after I got it and hung it up I absolutely love it! Nice & big.........the birds say 'thank you'. I love this feeder. I've had it before but after a few years & some rough handling the inside cracked and then broke. I am happy to find it on your website since I couldn't find it in the retail stores anymore. This feeder accommodates a variety of different birds and a selection of seed. I could not find a replacement for my feeder until I found your website. It is exactly like my previous feeder and exactly what I ordered. It was shipped in a timely manner. I like this feeder a lot. It is very sturdy! It is very well designed for the birds and their caretakers. The birds seem to like it and it's very easy to disassemble and thoroughly clean. The overall seed capacity is great; especially since you can have three different kinds of seeds in the feeder at once. This is also one of my favorites. The birds enjoy the big perches and feeds a party. I had purchased an aspects big dome for squirrels and rainy weather to hang above this feeder and it fits perfectly. The Triple Bin Party feeder is the best feeder I've ever owned. Our birds love it and always have plenty of seed to eat and a variaty of seed as well. One thing I really like about this feeder is that it is rodent proof. This triple bin is really nice. It allows the birds to eat in comfort and it's very sturdy. It will last many years. I purchased this feeder as a replacement for the exact same one, which lasted for 10 years on a pole in my backyard. It is easy for the birds to access, quite a few birds can feed at the same time, it holds plenty of seeds and is easy to fill. I would buy this feeder again. We bought the Triple Bin Party feeder as we had one before and could never find another in our area. The only complaint is that the feed comes out 2 fast other than that, it is exactly what we wanted. We bought the Triple Bin Party feeder as we had one before and could never find another in our area. The only complaint is that the feed comes out 2 fast other than is exactly what we wanted. We bought the Triple Bin Party feeder as we had one before and could never find another in our area. The only complaint is that the feeder comes out 2 fast other than is exactly what we wanted.